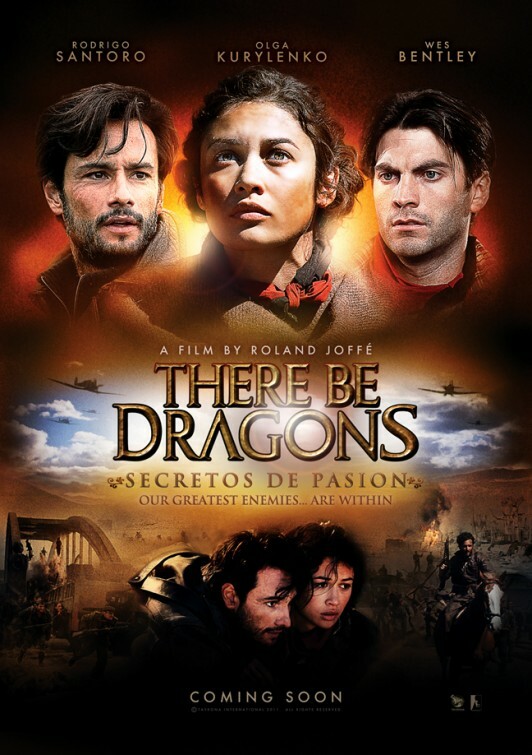 Roland Joffé’s There Be Dragons (2011) A Movie of the Spanish Civil War? or A Propaganda Piece for Opus Dei? There Be Dragons is a movie on the Spanish Civil War, focussing heavily on the founder of the Opus Dei José Maria Escrivá. That’s in itself problematic, but the movie has other shortcomings besides reeking of “propaganda”. There aren’t all that many movies on the Spanish Civil War that’s why I was quite keen on watching this movie. I normally like Dougray Scott and seeing that he’s in this, made me hope it would be good. Unfortunately he’s just a minor character, although the one who gets the ball rolling. Geraldine Chaplin who is also starring in this film has an equally small role. Roberto Torres (Dougray Scott) is a young journalist researching José Maria Escrivá (Charlie Cox), a priest and founder of the Opus Dei who is a candidate for canonisation. Roberto discovers that his own father from whom he is estranged since years, knew Escrivá. He travels to Madrid, hoping his father will tell him everything he knows about the priest. While Robert’s father Manolo (Wes Bentley) was friends with José Maria when they were kids, they later fought on opposite sides during the war. The movie tells their respective stories in flash backs. They don’t overlap all that often; it’s really the story of José Maria on one side, and the story of Manolo on the other. Only towards the end, they are briefly joined again. A third story line, tied to Manolo, reveals why the relationship between Roberto and Manolo was so difficult. It has something to do with a tragic love story involving Ildiko (Olga Kurylenko). Due to these different stories, which are only loosely connected, the movie really is a mixed bag. It glorifies the courage and determination of José Maria, his faith, his steadfastness. Although I don’t feel qualified to say much about the Spanish Civil War with which I’m not very familiar and even less about the role of the Catholic Church, I can still say that the depiction was very sentimental and never grabbed me. I was a bit more interested in the frame story between Roberto and Manolo. Another flaw was the tempo. This was one hell of a slow movie; it never really took off. This is too bad because the cinematography and the score were superior but I felt they were wasted on this film. I always thought that Roland Joffé was a director who would guarantee a good movie but unfortunately that isn’t the case. I have no clue what drove him to glorify the founder of Opus Dei. Very dubious. I can’t recommend this movie. I almost forgot to mention that this is another one of those movies in which all the English speaking actors talk in a heavy Spanish accent. Ludicrous. Have you seen it? Have seen another movie on the Spanish Civil War that you would recommend? This entry was posted in Movie, Reviews, Trailer, Uncategorized, War Movie and tagged Charlie Cox, Dougray Scott, Geraldine Chaplin, José Maria, Movies, Olga Kurylenko, Opus Deai, Review, Roland Joffé, Spanish Civil War, War Movie, Wes Bentley. el viaje de carol……………..u can say it is a spanish war movie but hardly depicts any combat scene…………though storyline in good………not great but good. Thanks , I’ll have a look. Not great but good is OK. Not every movie is a masterpiece. I just had a look on IMDb and it looks not bad at all. Thanks for the suggestion. I’ll probably try to catch this, so thanks. Spanish civil war films: land and Freedom (love this), Una Pasion Singular, Silencio Roto, Libertarias. Thanks for those suggestions. I have only seen Land and Freedom which is good. Your review + 11% on Rotten Tomatoes = not a chance in Hell I will be watching it. What is up with the grammatically challenged title? Wouldn’t “Pan’s Labyrinth” be considered the best movie set in the Spanish Civil War? I forgot about Pan’s Labyrinth. It’s one of my favourite war movies but I don’t see it that much as a Civil War movie. Yeah, that title… Not sure. In any case … Don’t bother. Thanks, Richard, yes, it’s an abomination, to be honest. I started watching it three times! And then I ended up watching the dubbed version. What’s that telling you? I do that very rarely. Thanks for all of your suggestions. I’m going to look for some of them, maybe not Carlos Saura though. I didn’t think he’d make cheesy movies. Depressing that it is so bad, there are so few movies on the Spanish Civil War. I would have thought that a Roland Joffe film would be worth it for the visuals alone, but clearly not this one. Yes, that’s what I thought as well but I was wrong. It’s quite awful. I can’t imagine you’d like it. “Fiesta”, 1995, with Jean-Louis Trintignant is a very good movie. I recommend it very enthusiastic. Agree with the enjoyability of Pan’s Labyrinth and Land and Freedom. Thanks a lot for the suggestion. An actor I like a lot.